Without a doubt, this is my most requested recipe. Therefore I have decided to release it to all my friends here on The Foodists as a “thank you” for all of your support! As with any recipe, you MUST be at least semi-competent in the kitchen and be able to follow directions. If you have any questions feel free to send me an email BEFORE you make it! If you wait until you are ready to put it in the oven I probably will be away from the computer at that time. If you share this recipe with anyone (and you may, I give you permission) remember to attribute it to me as author, as it is copyrighted and is an award winning recipe (All American Recipe Contest, July 4 1998 San Diego County Fair). This recipe may not be entered into any contest or competition, since it has already won one therefore using will get you disqualified by the judges. This is your classic “Mom’s Mac ‘n Cheese” type recipe, nothing fancy, just mac ‘n cheese with a breadcrumb topping. Let me know how you like it, and if you modify it let me know what you do and how it turned out in the comments section! Preheat oven to 350 degrees. Mix dry ingredients for breadcrumbs together in a bowl. Melt butter in pan; turn off heat. Add breadcrumb mixture and stir until well blended. Return mixture to bowl. Bring water to a boil in large pan. Add macaroni and cook approximately half the cooking time listed on the package, it will cook the rest of the way in the oven. Drain. In a saucepan over low heat, melt butter; add dry ingredients, mixing until all lumps are dissolved. Raise heat to medium high and continue stirring for about 3 minutes or until mixture begins to foam. Add evaporated milk (regular milk may be substituted). When thoroughly heated, start adding American cheese a little at a time, stirring constantly as it melts. Then add half of the Cheddar cheese the same way, a little at a time stirring as it melts. When the sauce is hot and creamy, add sauce to macaroni; stir until blended. Add the rest of the diced Cheddar cheese and stir. Pour into casserole dish. 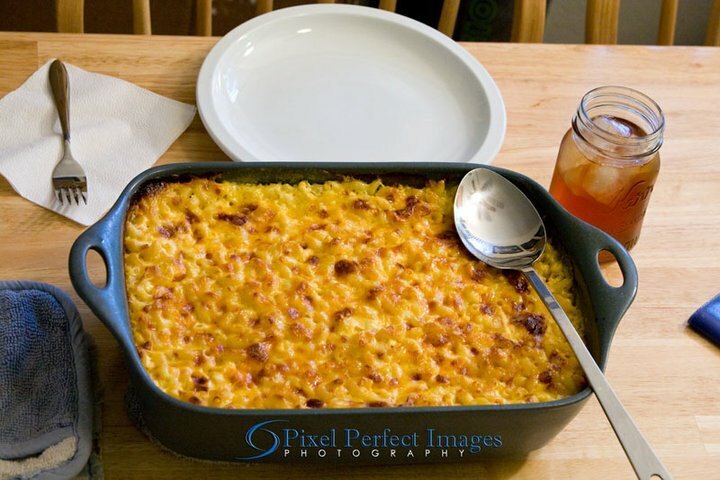 Sprinkle breadcrumb mixture over Mac n’ Cheese evenly; bake for 20 to 25 minutes or until bubbling around the edges and topping is a golden brown. Serves four as a main course or six to eight as a side dish.